Watch out space, there’s a new commercial cargo carrier entering the race. 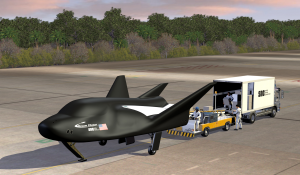 Sierra Nevada Corporation (SNC) has been given the go ahead from NASA to begin full-scale production of it’s “Dream Chaser” commercial space cargo plane. Scheduled to make its first mission in 2020, the company announced on December 18 that it had cleared the last milestone in its Commercial Resupply Services 2 contract. Now the company is able to move ahead with the full-scale production of the carrier which will be used to deliver cargo to the International Space Station (ISS). The Dream Chaser was originally conceptualized for NASA’s commercial crew program but ultimately sidelined by NASA in favor of designs from Boeing and SpaceX. A redesigned version of the original Dream Chaser, the cargo version includes fold-able wings and is capable of carrying 5,500 kilograms (approximately 12125 lbs) of cargo to the International Space Station and return 1,850 kilograms (approximately 4078 lbs) to Earth in a runway landing. SNC was one of three companies, alongside SpaceX and Orbital ATK (now Northrop Grumman Innovation Systems), to receive a commercial cargo contract from NASA in 2016. The contract guarantees each corporation at least six missions to the ISS. Various components of the full-scale Dream Chaser have already been produced and tested. At a conference last October, Steve Lindsey, Steve Lindsey, Vice President for Space Exploration Systems at SNC said he expected to be “the majority of the way through” assembly and testing of the first Dream Chaser by next October. High launch costs are one of the most limiting factors in commercial space operations. Increased competition between corporations is helping to reduce the cost of launches opening new doors for smaller companies. “When those launch vehicle prices come down — which, by the way, is about 80 percent of our costs on every mission we fly — that opens up the commercial market,” said Lindsey. As both competition and innovation increase, companies will face new pressure to stake their claim among the stars.